Tried to buy in 1996 but finally got me mini! Post subject: Tried to buy in 1996 but finally got me mini! I guess I'm the new guy.! I have a "few" bob to spend on it and I am looking for some advice on sourcing decent 2nd hand or reasonable new body parts, basically all of the panels forward of the doors rust has had a good go at her. She has the sports pack which I believe has a bearing on the type of wings? Maybe someone could confirm this? 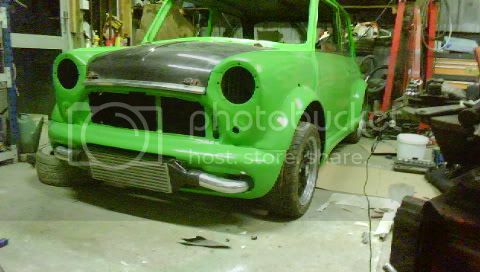 Would it stupid to consider 2nd hand panel parts on a mini..? Finally, any advice on sourcing internal fittings, all the originals are all working fine just want to put my own stamp on it! Post subject: Re: Tried to buy in 1996 but finally got me mini! miniquip up north can sort you wit pretty much everything and ian is a nice guy to deal with, will post overnight for like £10 or so.. Welcome to the forum and congrats on the purchase. Putting on secondhand panels on a Mini is a false economy. The damn things rusted when new and secondhand panels will rust even quicker. Use genuine Heritage panels from a supplier like Somerford in the UK who deliver within 3 working days and who many of us use. I have jsut finished a '98 Cooper restoration and their panels are excellent. Give me a shout at the number below some evening or even better, come along to our next club run which is on Sunday week, July 17th. Membership of the Irish Mini Owners Club costs 20 Euros. Like billy says for panels your better off buying new and for a complete front end personally I would use heritage parts from Sommerford. They are a lot dearer but are the best fit, a good panel beater can make most of the other cheeper panals fit. The sportspack wings are differant with a cut out for the larger wheels but standard wings can also be cut out. Thanks for the info lads and Billy I appreciate your offer I will give you a call in the next few days.